To start with I am not simply a sculptor in bamboo. I'm also a grower of bamboo. I plant it. I nurture it and I harvest it. An artist - grower. This adds quite a connected dimension to the relatively simple process of sculpting. The drilling, cutting, bending and weaving is tempered by the intimate and natural process of gardening - of waiting and observing of admiring and worrying. When I finally harvest, clean and dry a piece of bamboo, I feel quite humbled by its voyage so far, what it has come through as well as what it has become. I'm also humbled by the amount of work it takes. It's not straight, it's wide at the bottom and skinny at the top, has bumps its entire length and the thickness of its wall varies from bottom to top as well. It is the antithesis of the world of "Home Depot, 4x8, 2x4, processed and manufactured, square corners, bar coded, off the shelf into your cart, thank you very much". Bar codes don't grow in nature, not that they're not useful, it's just nice to follow something from it's origin through a years of growth to admire it's potential. A valuable perspective. It's a lot more work starting with the raw material but there is insight not achieved by otherwise. At the very least appreciation. At this point of promise, with the bamboo harvested dried and cleaned, the fun begins. In contrast to that humble admiration it also feels good to finally have my way with it. To directly act on it. To make something. A new layer of discovery begins as its strengths and limitations become apparent and ditto for my designs. There is a lot of almost good stuff which is to say failure. I do a lot of prototyping to test designs as well as assembly techniques. For viewers, I'm hoping for astonishment. At least initially an unthinking reaction/impression and then a chance to get lost in the rhythm of line, shadows, form, texture and the mix of unnatural and natural patterns. It is perhaps a space that can be walked through. A shelter, a comfort. Complex lines and rhythms filtering in the elements outside. Bars. An arch. An ark. A child’s game. A quiet place of safety and repose. A natural preserve in an urban space. A flow. Detailed simplicity. I am cheating certainly in using materials that have organic features that are attractive all on their own. I see a balance between the wild and tamed, struggle and surrender, serious and serendipitous. I can't help but to recall the plants original mission to reach out and harvest photons from the sun. That function echoes through the sculptures still. A stretching, reaching, gratification, success and celebration. Survival. After my small insight, sweat and tears I nurture the enduring strength of the material to brag solo and loudly. Why bamboo? I've lived in and continue to visit Henri Pittier National Park in Venezuela. This is a coastal rainforest with a surprising variety of flora and fauna as the altitude lifts from the sea coast to 2000 meters and includes many varieties of bamboo which are used in almost every facet of daily life. The forest is compelling. To the right is a picture of the road leading into the village where we live. 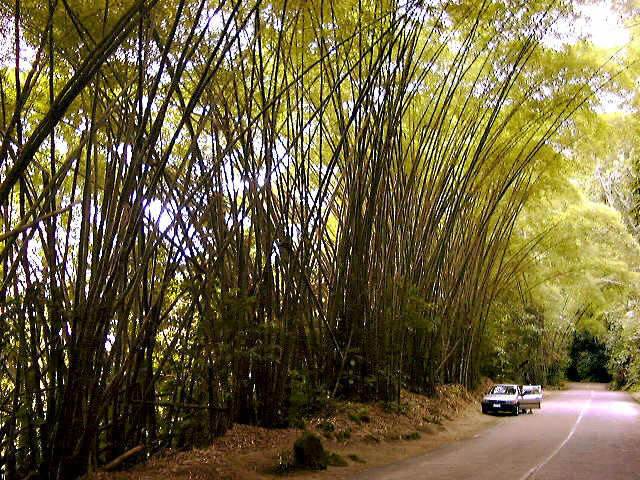 The giant bamboos are not only majestic, they are essential in retaining the earth and thereby the roads that are the sole way in and out of this area.